Network File Systems, generally known as NFS is file-level storage which is allocated by shared storage. It is Network attached storage that can be shared across a cluster in vSphere. It allow an user on a client computer to access filers over network similar as local storage. NFS Volumes are created at storage end then you have to add it on ESXi as datastore. We have different types of Storage which provides IP based and NFS Storage. In real environment, we generally use NFS to store ISO images, Backups, VM templates and contents which doesn't required frequent read/write operations. Let's take a quick insight here about this. #Reference: Refer this article "Add NFS Datastore to ESXi Host"
- NFS Volume is stored on Network Attached Storage. 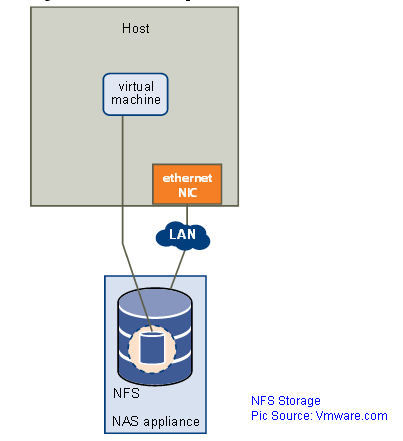 - vSphere supports NFSv3 and NFSv4.1 versions of NFS protocols. - VMkernel port group is required for NFS Storage. - Port 111,2049 (TCP,UDP) should be working. - NFS v3 and NFS v4.1 supports both IPv4 and IPv6. - NFS v3 and NFS v4.1 datastores can coexist on the same host. - NFS 4.1 only supported to ESXi hosts 6.x and later. - You can't directly upgrade NFSv3 to NFSv4.1 as it's not supported by vSphere. - Use only ASCII characters for your NFS network topology to avoid unpredictable failures. - When you mount the same NFS 3 volume on different hosts, make sure that the server and folder names are identical across the hosts. - Same datastores can't be mounted from different versions of NFS. - NFS v4.1 supports multipathing and multiple IP addresses can be use to access single volume. - Create a new NFS 4.1 datastore, and then use Storage vMotion to migrate virtual machines from the old datastore to the new one. - Use conversion methods provided by your NFS storage server. For more information, contact your storage vendor. - Unmount from one version and then mount as the other.